World Cup Cricket is held once in four years – Dhoni’s men in 2011 repeated what Kapil Devils did in 1983……….the limited overs tournament was first held in 1975 and was then known as Prudential World cup. Did you know that two years prior to that in 1973 the Women’s Cricket World cup was held. It was won by the hosts (England). England, Australia, New Zealand, Trinidad and Tobago and Jamaica were joined by an International XI and a Young England side in a round robin league which saw the top team win the World Cup. It was a round-robin format and the finals was held at Edgbaston on 28 July 1973 and was distinguished by a commanding century by Enid Bakewell of England, whose 118 formed the bedrock of England's imposing 279-3 in their 60 overs. The cup was presented by Princess Anne and the winning England team were hosted at a reception at 10 Downing Street by Prime Minister Edward Heath. The 2013 ICC Champions Trophy was held in England and Wales between 6 and 23 June 2013. India won the competition, beating England by five runs in the final after overcoming South Africa, the West Indies and Pakistan in the group stage, followed by a semi-final victory over Sri Lanka. The finals was played at Edgbaston, Birmingham where that finals of 1973 was also held. Edgbaston Cricket Ground, home to Warwickshire County Cricket Club is in Birmingham. Birmingham is a city and metropolitan borough in the West Midlands of England. It is the most populous British city outside London with 1,085,400 residents (2012 estimate). A medium-sized market town during the medieval period, Birmingham grew to international prominence in the 18th century at the heart of the Midlands Enlightenment and subsequent Industrial Revolution, which saw the town at the forefront of worldwide developments in science, technology and economic organisation, producing a series of innovations that laid many of the foundations of modern industrial society. By 1791 it was being hailed as "the first manufacturing town in the world". The modern Birmingham is a major international commercial centre, ranked as a beta−world city by the Globalization and World Cities Research Network. People from Birmingham are called 'Brummies', a term derived from the city's nickname of 'Brum'. As we regularly complain about our auto fares (vastly different now with implementation of meters) ~ there is news that Police and City Council’s enforcement team are on the look out for unlicensed drivers, known as ''plyers'' in a clampdown on bogus cabs at Birmingham. Over there only hackney drivers can legally pick up customers without a booking so private hire cabs who take fares straight from the street are breaking the law. Most private cabs who pick up passengers from the street do this to make some quick money. But some have a darker motive to lure vulnerable, often drunk, lone women into their cars. Seventy five women have been sexually assaulted while trying to get home from a night out in Birmingham in the past two years. Most of the city's 1,300 legitimate black cabs and 4,500 private hire drivers work hard to make an honest living and want the rogues off the road as much as anyone else. About 100 drivers lose their licenses for 'plying' offences in Birmingham every year and these are the drivers being targeted by the police. 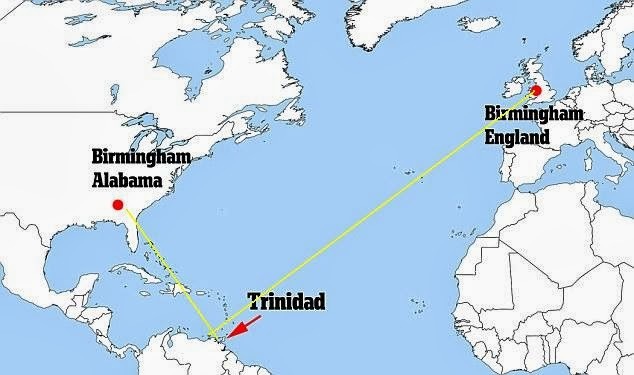 A couple accidentally booked a cheap flight to the Caribbean from Birmingham but unwarily – it was from another Birmingham Airport - 4,000 miles away. Kevin Jones and his partner Jeanette were thrilled when they bagged two return flights to Trinidad for just £800. But when they arrived at the West Midlands hub, they were told their American Airlines flight was actually taking off from Birmingham-Shuttlesworth International Airport - the biggest in the U.S. state of Alabama. The partners were devastated to discover their 'bargain' flight was actually leaving from Birmingham, Alabama ~ as the girl at the information desk broke the news with a very sympathetic look that our flight was leaving over 2,000 miles away. The pair are now on a bargain break in the Spanish resort of Benidorm instead, the newspaper reported. Despite the 4,200-mile distance between them, the two airports have some surprising similarities. They are a similar size and both went into service around the same time - the UK's version was commissioned in 1928, while flights began at the U.S. version in the same year. It is reported that it is not the first mix-up involving a Caribbean flight. A few months ago, grandmother Lamenda Kingdon, 62, from Plymouth, fell victim to another namesake - except she ended up in the Caribbean by accident. As she sipped a gin and tonic at 30,000ft and looked forward to her break in Granada, Spain, a fellow passenger broke it to her that they were actually travelling to the island of Grenada. In 2008 Birmingham City Council chiefs were left red-faced after they distributed 720,000 leaflets praising Brummies for their recycling - which showed the skyline of Birmingham, Alabama, instead. It happens to us – (sometimes) – we ask for direction of a local street / town – get directed to its namesake elsewhere ….and sometimes what you think locally acts globally also.